Thank you for your interest in participating in Christian Fashion Week, which will take place February 15-20th, 2015. Christian Fashion Week where fashion meets faith in a way that challenges all types of designers to create something wholesome and life giving with God as their inspiration. Our commitment is to redefine beauty in the fashion industry, showcase established and emerging fashion designers, and to expose them to buyers, services, entrepreneurs, press, and industry professionals to increase their reach in the global market. We are seeking to partner with businesses, corporations and organizations to support and promote the fashion community within the Church not only within the Tampa Bay area but around the world. Christian Fashion Week wants people to know that we C.A.R.E. about Contextual modesty, Affordable fashion, Responsible usage of natural resources, Ethical labor practices. Christian Fashion Week will be holding its annual Fashion Week Event on February 15th - 20th of 2015, with our main showcase on the last day. Emerging and established designers from all over the world will be anxiously preparing months in advance to showcase their new and exciting fall collections. Proceeds from Christian Fashion Week will be donated to The Christian Fashion Fund. A non-profit fund created for the purpose of financing the entire fashion lines of new designers who want to create modest clothing. The CFF (Christian Fashion Fund) provides a grant to these designers, announced at each annual Christian Fashion Week, and provides modesty guidelines as the only provision for using the funds. 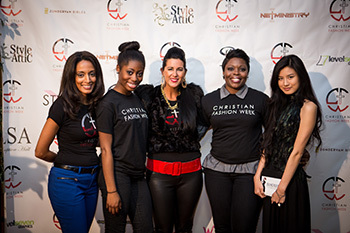 In addition, CFF grantees are then given a spot in the following year's Christian Fashion Week. Sponsoring this event will give your business/organization the opportunity to be recognized as one who supports the dreams and aspirations of its community and consumers. Accompany us as a sponsor for this amazing event. Showcase your business to the Christian fashion community as well as to the world during this year's Christian Fashion Week 2015 and make a difference. To gain access to our sponsorship information, please create your FREE Backstage account and you will be directed to our Sponsor Center.